Yesterday morning we went to my mom's so Jakob could plant some seeds. ... Jakob sure is strong, he carried some heavy branches all by himself. 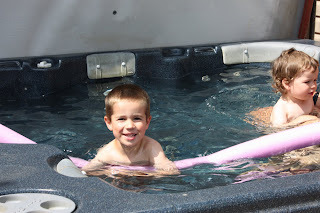 After lunch the boys went for a "swim" in the hot tub with Oma. 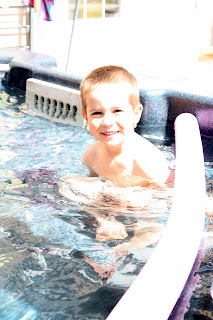 Levi wasn't sure about "swimming", but he was happy to hang out in the corner on a higher seat. Aim's Levi is starting to look so much like a little boy and not a baby! I can't believe how big he's getting.